•	6 cups of milk. •	1 cup of Egyptian rice. •	2 cups of fine cake. •	1 cup of butter. •	1/4 a cup of blossom water. •	4 small pieces of Arabic mastic. The syrup: •	5 cups of sugar. •	2 cups of water. •	1 teaspoon of lemon juice. •	Filter the rice and wash it many times, then immerse it with hot water for 3 hours. •	Filter the rice and make rice fine by pounding or mashing it (with blender). •	Put milk in a pot on heat. •	Add fine grinded rice to the milk gradually and stir continuously with a wooden spoon. •	Leave the milk and rice mix on heat for 30 minutes approximately with continuous flipping to avoid adhesion of it with the pot bottom. 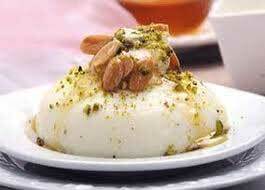 •	When the rice melts totally and the milk becomes solid, pound mastic with a tablespoon of sugar to be fine. •	Add mastic to the milk and flip for 3 minutes approximately, then raise it from the heat and set it aside. •	Paint a tray with a size of 25×45 cm that has a short edge with 1/2 a cup of butter. •	Then, sprinkle a cup of grinded cake on the tray until it covers all the bottom of the tray. •	Pour milk on the cake carefully with a tablespoon until the milk covers cake and until kashtaleieh thickness becomes about 1.5 cm. •	Wet the spoon a little and smoothen the surface of milk until it becomes equal. •	Sprinkle the remaining cake cup on kashtaleieh equally, then pour 2 tablespoons of melted butter on it. •	Put the tray in a hot oven for 10 minutes only, then leave it to cool. •	Cut kashtaleieh into squares (as needed) and pour syrup on it, then serve it warm or cold. The syrup: •	Put water and sugar on a medium heat and stir until the sugar melts, then add blossom water and lemon juice ,and then leave the syrup to cool.